(TORONTO, ON – October 4, 2016) The 2017 Toyota Prius Prime – it’s more than a name change. Find out why as Toyota Canada brings this all-new plug-in hybrid Prius to market this year. The Prius Prime goes the distance – more than 965 km on a single tank of gas and a full battery charge. And it does so with no sacrifices to style, comfort or amenities. The 2017 Prius Prime is the evolution of the Prius Plug-In Hybrid – and it’s more of a revolution, with an all-new aerodynamic exterior, an all-new, premium interior, an impressive long list of equipment and advanced technologies included as standard and more. 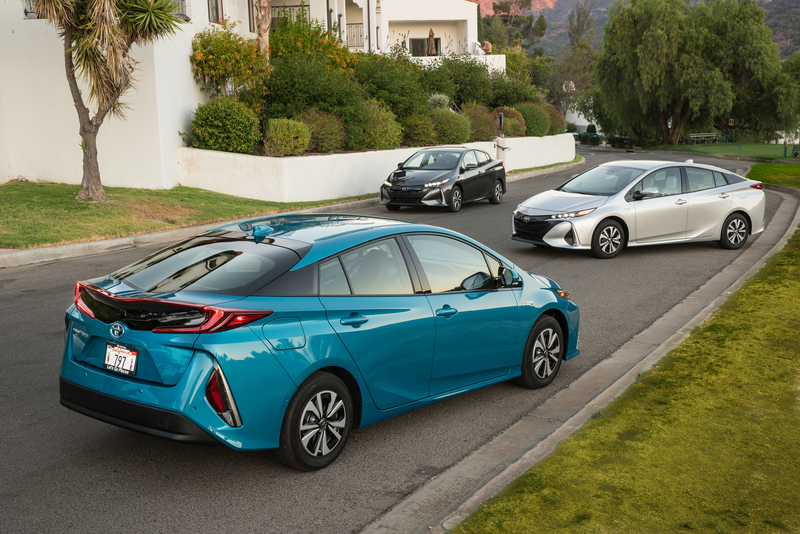 The improvements start at the core of the Prius Prime, which is built using the Toyota New Global Architecture (TNGA) platform. Introduced on the fourth-generation Prius in 2016, it results in a stiffer chassis and lower centre of gravity which contributes to better handling and allows Toyota designers to create vehicles with lower cowls for better outward vision and more sporty design. A new Toyota Hybrid Synergy Drive – developed for Prius Prime – employs Toyota’s first use of a dual motor-generator drive system to boost acceleration, plus a new Atkinson cycle four-cylinder engine that achieves ground-breaking thermal efficiency of more than 40 per cent. This new hybrid drive joins aerodynamic enhancements and weight reductions to significantly boost Prius Prime’s fuel efficiency. Prius Prime is 22 more efficient than the Prius Plug-In, with an estimated efficiency equivalent to just 1.96Le/100 km with a full battery charge. The hybrid system’s new, more powerful lithium-ion storage battery also enables Prius Prime to operate in electric vehicle mode for more than twice the range of the Prius Plug-In, at more than 35 kilometers – making it possible for Canadians to do most of their daily in-town driving without using a drop of gas. And, if they do run out of electric charge for any reason, they can drive confidently knowing the efficient gasoline-electric hybrid system will get them to their destination, every time. This electrifying performance is matched by an equally electrifying design. Prius Prime is longer, lower and wider than its predecessor, for a road-hugging stance. The body is chiseled and features edgy character lines. And as a technology showcase, Prius Prime makes an immediate statement curbside, with quad LED headlamps and LED rear combination lamps. The technology experience continues when the driver uses the touch-sensor lock to open the door. Inside, Prius Prime’s four-seat cabin is comfortable and versatile, with heated front seats, a 60/40 split folding rear seat, sound-insulating windshield and front door glass, centrally-mounted gauge panel and premium interior finishes. Prius Prime is also standard equipped with an extensive list of class-leading safety technologies – including Toyota Safety Sense P (Pre-Collision System, Lane Departure Alert, Automatic High Beam, Dynamic Radar Cruise Control) and the Toyota Star Safety System (Antilock Brake System, Brake Assist, Electronic Brake Force Distribution, Vehicle Stability Control, Traction Control, Smart Stop Technology), plus eight air bags, whiplash-injury-lessening front headrests, a backup camera and more. The 2017 Toyota Prius Prime (starting MSRP: to be announced later) is very well equipped. Technology highlights include a 7” Display Audio System with SIRI Eyes Free, navigation, climate control with automatic temperature control, heated steering wheel with Softex cladding, dual 4.2” multi-information displays, an eco-drive monitor, the Toyota Smart Key System with Push Button Start, and more. The 2017 Toyota Prius Prime Technology (starting MSRP: to be announced later) adds an incredible set of advanced features. These include a premium audio system with a larger, higher definition multimedia screen, the Qi wireless charging system for compatible personal electronics, a full-colour Head-Up Display, Intelligent Parking Assist, rain-sensing wipers, the Blind Spot Monitor with Rear Cross Traffic Alert safety systems, LED fog lamps, and more. It also adds premium features such as Softex leather seating, step lamps, touch sensor locks on the front passenger door and rear hatch, and more.